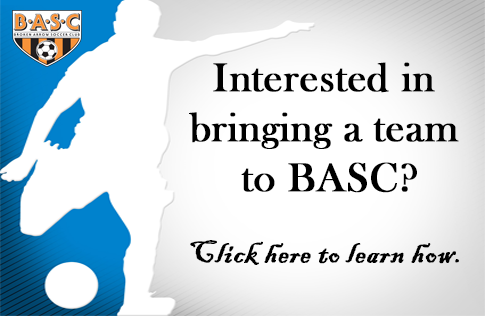 Would Your Team Like To Play With BASC? Would you like to bring your team to Broken Arrow Soccer Club? Click here to let us know! Predominately the most organized youth soccer club in the State of Oklahoma. Fully cared for facilities, including prestigious field maintenance, staffed concession buildings and restrooms (no port-a-johns!). You will have a fantastic support system as a coach and a team at BASC! We offer our coach's: Free coach license training, free practice tools, a free meal at our coaches meeting, a BASC coach polo shirt, discount membership to the HUB gym and office staff to assist you with questions or problems throughout the season. Players, Parents and Coaches will be members of the fastest growing & largest youth soccer club in the State of Oklahoma. According to stats from Oklahoma Soccer Association, Broken Arrow Soccer Club is the largest youth soccer club in our State! BASC hosts many fun events throughout the year that kids love, including 'Fun Day' events, Roughnecks clinics & signing sessions, Parades, Halloween event, Soccer Santa event, Summer camps, Goal keeper camps, Tournament opportunities with team discounts for members + more! Free Goalie training for U9 thru U19 members. Parents and Coaches will have an educated, professional office support staff who are available to answer your calls, texts or emails. Parents and coaches may stop by and ask questions at the conveniently located office on Main Street throughout the business week, 12 months per year! BASC allows each coach to choose which uniform they want for their own teams! $105 registration fee includes your player registration, insurance, field fees, referee fees and many other member benefits! BASC offers college scholarships every year! All BASC players ages 3 through 8 receive medals each and every season! Broken Arrow Soccer Club is the only club that celebrates with and honors it's U9 through U19 league winners each season through our distinguished BASC awards ceremony! To make sure you have enough players to field a team, click here for the chart to assist you with how many play on a team, per age group! Our BASC Registrar can assist you via email with any questions, or you may call or stop by the BASC business office with any questions! Our office is conveniently located at 1001 S. Main Street in Broken Arrow. Our office phone is 918-258-5770. Click here for business hours, we are open 12 months per year! We look forward to working with you on a fun soccer experience for your whole team!